Methodism in the Reems Creek Valley of north central Buncombe County has a rich history dating to 1805. It was in that year that pioneer John Weaver, after hearing Bishop Francis Asbury preach nearby, built a log Methodist meeting house on a ridge overlooking his cabin and farm. Through succeeding generations this small band of believers flourished and new buildings were constructed in various locations throughout Weaverville to accommodate the growing congregation. 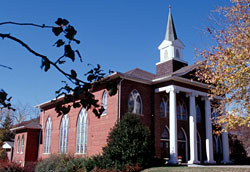 From 1919 to 1920, the present Weaverville United Methodist Church was constructed on Main Street, becoming the fifth successive meeting facility of the congregation in Weaverville. Plans to construct the present building began in 1917 shortly after the fourth Methodist Church, then located on Church Street, was struck by lightening and burned. Discussions concerning where to build a new church ensued--some favored rebuilding at the old site on Church Street while others wanted to relocate to a more prominent location on Main Street. On April 12, 1919, Charles R. Moore and his wife Louise conveyed a lot on Main Street to the trustees of the Weaverville Methodist Episcopal Church, for the purpose of constructing a new church building. 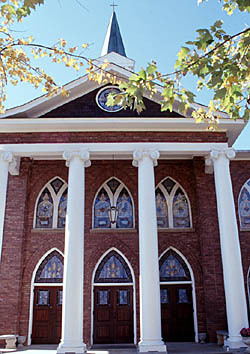 Contractors Zebulon Vance Robinson and Douglas Conklin Roberts erected the building. The first services were held on Easter Sunday, 1920. 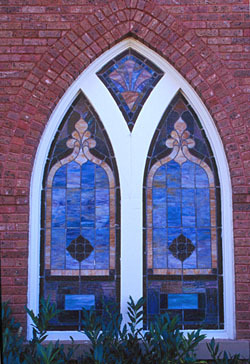 Weaverville United Methodist Church is a well preserved brick building reflecting influences of both the Gothic Revival and the Classical Revival styles. A belfry and steeple were added to the building in the mid-1950s, although a crack in the bell has caused it to hang silently for nearly half a century. The most striking features of the church are the beautiful stained glass windows in the sanctuary. The first, and most significant, is the window on the south wall depicting the "Good Shepherd." Given to the church in 1920 by Louise Moore as a memorial to her deceased husband, the window was later discovered to be made of Tiffany glass. The other window, located on the north wall, was given by the Weaver family and depicts three biblical scenes: Jesus Knocking at the Door, The Sower of Seed, and The Good Samaritan. Weaverville United Methodist Church is located at 85 North Main St. just opposite the intersection of Church St. in Weaverville. The congregation still worships in the building. Call 828-645-6721 for further information.